Some great recent press for the Ameros who often place DVD's in CD's, give out freely, and spread truth through music. "Commission Report's covering up for government crimes"
Lyric from the Ameros song: "Weight of the World"
Attention: We are seeking out family members and first responders who would be willing to call in to an interview to give testimonies. Please be in touch. "They are original independent voices who have something to say. They have a lot of energy and their lyrics are thought provoking. They are relevant to Troy and to Albany, but they are relevant to the rest of the world as well." "(one) of the Capital region's hottest bands." "You can definitely hear the influence of Hendrix in your music." The Ameros are now giving away free copies of Zeitgeist parts II and III with every CD sold. We'll be having a great time. Come get your truth on. Collaborating with the Campaign for Liberty. The Ameros are continuing to play 50/50 benefit shows with 9/11 Truth Groups around the country. Raise money and awareness for your local 9/11 Truth group by having a concert with the Ameros near you. Their new song "Terminator Seeds" is quickly becoming a favorite among fans. New song by the Ameros: "Weight of the World"
Wanted to post this new song by the Ameros. I think that 911 blogger readers will appreciate the lyrics. The video quality isn't great but the sound is good. Kawari and Jesse moved to Albany to centralize their forces against the "War on Logic" currently being waged by those in power. Joining with Sean Muniz, a local activist leader, and Kiki Vassilakis on percussion, they are now storming the Albany Music scene, and fortifying key locations. Defending truth and justice everywhere, The Ameros are here to go to battle for those who seek to usurp power, and to bring about real change. Believing that there is a dire need to inflict social change through music, the Ameros write music with penetrating honesty to cut through the mass ocean of substance-free garbage. You won't be seeing the Ameros on any Coca-Cola commercials anytime soon or holding a prominently placed T-Mobile Sidekick(tm) in their music videos. The Ameros cannot be bought with fiat currency. Coming soon to a North American Union near you. Help the Ameros climb to the top of the local charts at Reverbnation.com and drive more people to 9/11 truth. Best part - totally free, get to listen to some great music, and sign up on our mailing list. We're currently ranked 10th in local music and 2,158th in Rock. It won't take much to push us to the top. We already took down the Jonas Brothers. Haha. If you're interested in having a 50/50 benefit concert for your organization, here's how it works... you bring 14 people or more, and we split the profits with you! This keeps the Ameros music going, your organization going, and gives you a way to get together and relax! So be in touch. Contact us through myspace, reverbnation, or facebook. Check out our song at the bottom called "Terminator Seeds" about the New World Order. 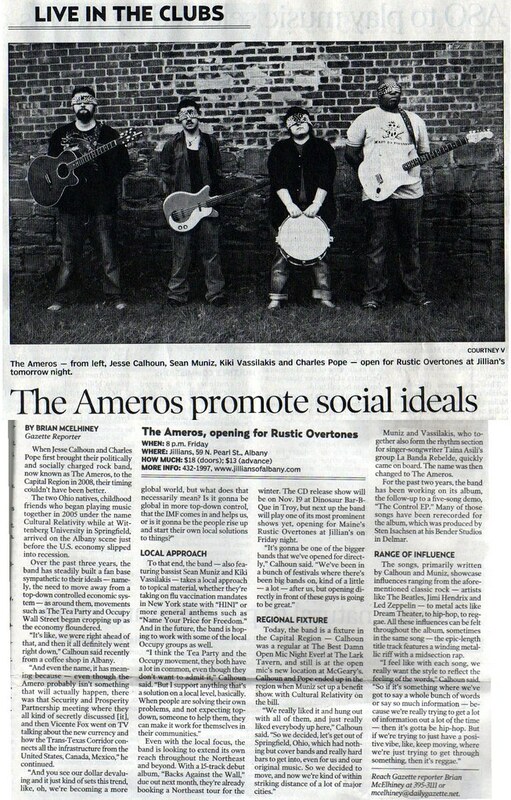 Hot on the heels of their 9/11 Benefit Concert that made Channel 9 News in Albany, NY, the Ameros (Formerly Cultural Relativity) are taking their brand of political rock to the airwaves. Last Sunday on 104.9 The Edge their song "One Song at a Time" debuted. Speaking of a false left-right paradigm, deforestation, and more, this song sets out the goal of the Ameros. Changing the world, "one song at a time." Currently planning their 2009 tour, they are looking to do 50/50 benefit shows for 9/11 Truth groups in the Northeast. If you want us to do one near you, get in touch immediately because dates are filling fast. Note: Any of these dates where 14 or more 9/11 Truth people show up, we will split what we make. Make sure to let the doorman know you're there to see the Ameros! If you want to do a 50/50 benefit show / group meeting contact us immediately! The Albany chapter of both 9/11 Truth and 2nd Responders will be holding a benefit concert for the forgotten heroes of 9/11. All proceeds will go to the Feal Good Foundation. Featuring music from Jared Funari, Mother Judge, Kode Blue, The Crayons, and Cultural Relativity, it is sure to be a night of amazing music and good people.